The funding agreement, signed at the Forum Fisheries Agency headquarters in Honiara with the New Zealand High Commissioner to the Solomon Islands, HE Donald Higgins, will cover services and advice from FFA and the Oceanic Fisheries Program of the SPC to ensure a better performing tuna fishery and a more viable stock. Countries sharing in the southern albacore longline fishery that are participating in the development of the Tokelau Agreement include the Cook Islands, Fiji, Kiribati, Niue, Papua New Guinea, Samoa, the Solomon Islands, Tokelau, Tonga, Tuvalu and Vanuatu. Welcoming the funding, FFA Director General James Movick thanked the New Zealand Government for its continued strong support of regional fisheries and said he looked forward to the proactive partnership of New Zealand’s Ministry for Primary Industries, MPI in the project, providing resources and knowledge with its Pacific neighbours. 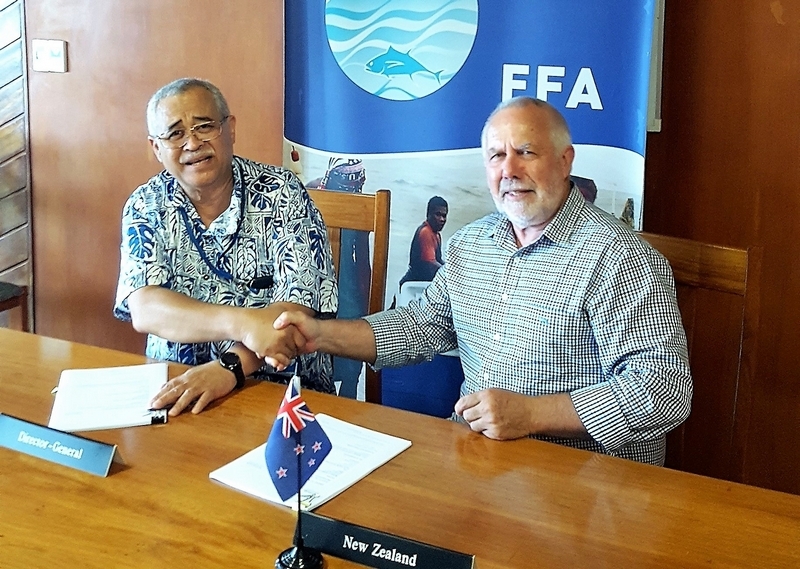 "This funding is timely as this year will be one of intensified efforts within the Western Central Pacific fishery region to deliver the best conservation and management outcomes for the future of South Pacific Albacore and tropical tuna stocks," says DG Movick. "As such this boost from New Zealand will help developing Pacific SIDS to better ensure robust management and performance of the Pacific tuna longline fishery (yellowfin, bigeye and albacore tuna)". Ambassador Higgins says the funding is aimed at achieving greater success in lifting returns and improving sustainability in the southern longline fishery, similar to what was achieved in the tropical purse seine fishery through collective action, and demonstrates the value of regional mechanisms such as the vessel day scheme and the proposed Tokelau Arrangement catch management scheme.